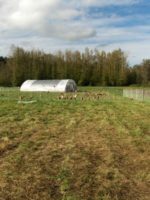 CleanFood Farm (CFF)is a certified organic farm with 10+ acres located near Orting WA. Six-plus acres are in organic pasture. We practice management intensive grazing with ruminants leading followed by pastured poultry. Three+ acres are planted in certified organic blueberries, which are fertilized with organic poultry compost. The blueberries are interplanted with red clover, which is grazed by broiler chickens.